Recommended: King Fish, Swordfish, or any firm textured fish. Wash fish thoroughly in water with lime or lemon juice added. Dry thoroughly. Combine salt and black pepper and coat the fish with mixture. Set fish aside on paper towels. Heat oil in frying pan over hot heat. Fry fish on both sides until cooked dry. 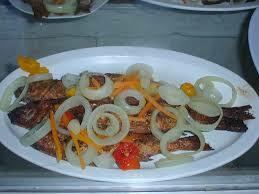 Set fried fish aside in a glass baking or casserole dish. In a saucepan, combine vinegar, sliced onions, scotch bonnet pepper, allspice and peppercorns, and bring to a boil. Simmer until onions are tender, remove from heat and cool. Pour over fish and let steep in refrigerator for several hours. This dish is usually served at room temperature, but may also be served cold, or slightly warm.